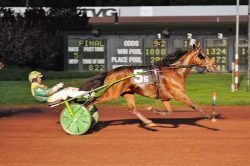 Hightstown, NJ – Jeff Gillis has no complaints about Will Take Charge’s 2018 season, a campaign that saw the gelding finish fifth on the money list for older trotters, but he also believes it could have been better. Will Take Charge, who makes his 2019 debut in Saturday’s (March 23) open handicap at Yonkers Raceway, won nine of 26 races last year and earned $469,535. His victories included the Maxie Lee Memorial in a world-record-equaling performance and the Crawford Farms Open Trot, but he won only once in his final 10 starts and finished off the board in five of six Grand Circuit finals during that span. Will Take Charge makes his 2019 debut in Saturday’s open handicap at Yonkers. Curtis Salonick Photo. “It’s hard to complain about the overall money he made,” said Gillis, who trains Will Take Charge and joined Mac Nichol in ownership of the horse last fall. “I did feel that he went off form at an inopportune time. Maybe it was in part due to less than ideal management. He raced through last winter and it maybe caught up with him late in the year. Will Take Charge will enter Saturday’s race off a four-month respite. Prior to the layoff, the gelding had made at least one start in a month from May 2017 through November 2018. Nichol purchased the horse in November 2017. He was previously trained by John Bax and was runner-up in the Ontario Sire Stakes championships at ages 2 and 3. For his career, Will Take Charge has won 21 of 76 races and earned $900,436. Will Take Charge will start from post six in a field of eight Saturday with Tim Tetrick in the sulky. The gelding prepped for his seasonal bow with two qualifiers, winning in 1:58 on March 7 at Woodbine Mohawk Park and winning in 1:57.1 on March 15 at Yonkers. Gillis said Will Take Charge’s first stakes test will be the Arthur J. Cutler Memorial on May 4 at the Meadowlands. “I feel like we’ll be right up there near the top; at least that’s the plan,” Gillis said about the upcoming campaign in the division. Saturday’s card at Yonkers also includes six second-round divisions of the George Morton Levy Memorial Pacing Series. Winners from the first round were Anythingforlove A, Ideal Jimmy, More The Better N, Rodeo Rock, The Wall, and Western Fame. The Levy and companion Blue Chip Matchmaker Series, which is Friday (March 22) for older female pacers, both feature five preliminary rounds followed by added-money finals April 20. For Saturday’s complete entries, click here. Racing begins at 6:50 p.m. (EDT).